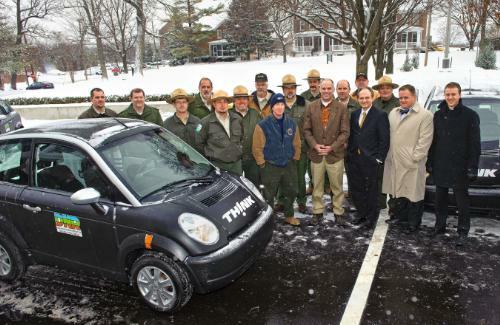 THINK has delivered its first U.S.-built cars to the State of Indiana for use in its government fleet. The 15 vehicles, which were shipped from THINK's manufacturing facility in Elkhart, Ind., will be the first electric passenger vehicles with American-made, Lithium-ion batteries used in a U.S. fleet operation. "We're proud to be the first manufacturer to deliver an all-electric car built in the U.S. with an advanced battery that suits the needs of government and commercial fleet operators," said THINK CEO Barry Engle. "Our delivery today is part of a larger effort to help transform the U.S. light-duty vehicle fleet from one that is mostly dependent on imported oil, to one that is fueled entirely by domestically produced electric energy." "As part of that goal, we've made a strategic decision to target initially the many millions of fleet vehicles in operation in the U.S. market," Mr. Engle added. "These fleets can jumpstart vehicle electrification in America's cities and help push the industry past early adopters into mainstream consumer markets. Fleet sales will drive up vehicle and battery production volumes and drive down costs, which will benefit retail consumers." The economics of electric vehicles for fleet operators in terms of cost of ownership are highly positive. With defined travel routes and centralized recharging and service, fleets are the natural platform to launch this new industry. The THINK City model is an all-electric, zero-emission car designed in Scandinavia for fleet applications and urban commuters. Durable, highly maneuverable and with low maintenance, the THINK City can travel 100 miles on a single charge, using advanced Lithium-ion batteries manufactured in Indiana by Ener1, Inc. The vehicle has accumulated more than 35 million road miles in customer experience since it was first safety certified in Europe in 1999. The vehicle presentation took place today at Fort Harrison State Park outside of Indianapolis and was presided over by Governor Mitch Daniels. The cars were delivered to the Department of Administration and will be used principally by the Department of Natural Resources in the state's park system. "THINK found a great place to establish its business in Elkhart, and we're proud to be the first customer," said the governor. "We believe that the coming era of electric cars, like the THINK City, will find its home here in Indiana." Indiana Department of Administration director Rob Wynkoop, whose agency maintains the state vehicle fleet, said: "We saw this specific green initiative as an opportunity to test alternative energy vehicles in real-life situations. We believe the state parks provide the best locations to test these vehicles." Mass deployment of electric vehicles in the state of Indiana is being facilitated by Project Plug-IN, an initiative organized by the Energy Systems Network (ESN), which is creating one of the most advanced ecosystems to support electric transportation in the country. By early 2011, ESN will place 100 or more electric vehicles and supporting charging infrastructure with government and corporate fleets, as well as selected individual commuters, across the Indianapolis metropolitan area. Project Plug-IN enlists a wide range of industry and government partners to solve technical and regulatory challenges related to preparing communities for electric vehicles and is helping lead the national government-industry dialog to develop deployment community strategies. "Our goal with Project Plug-IN is the seamless transition for consumers from gas-powered to electric cars," said ESN President and CEO Paul Mitchell. "To make this happen requires collaboration among vehicle and battery makers, utilities and government agencies at all levels and the willing participation of fleet operators, like the Department of Administration. The response so far has been tremendous." THINK plans to roll out retail distribution in select U.S. cities in the second half of 2011. The retail distribution timeline coincides with the company's plans to expand the production line at its Elkhart facility, where the company currently employs more than 25 local workers. By the end of 2011, THINK will have more than 100 people in Elkhart building electric cars and more than 415 by the end of 2013. The company also builds the THINK City in Finland for sale in Europe.